Argentine President Cristina Fernandez de Kirchner has made an emotional farewell speech to supporters in the capital, Buenos Aires. The outgoing president urged people to take to the streets if they feel betrayed by the new center-right government. Conservative Mauricio Macri, who won a run-off election last month, is due to be sworn in as president later. Mauricio Macri inherits problems including high inflation and a low level of foreign currency reserves. He has promised a new era of change and reconciliation. 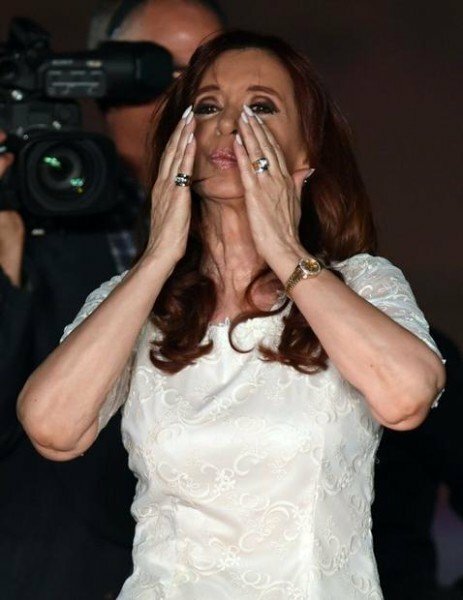 Addressing tens of thousands of cheering supporters outside the La Casa Rosa presidential palace in Buenos Aires, Cristina Fernandez de Kirchner defended her record. “We believe in what we have achieved so we need to have a positive attitude to ensure that these things will not be destroyed,” she said. “When you feel that those who you trusted and voted for have betrayed you, take up your flags,” she added. Cristina Fernandez de Kirchner is to skip today’s swearing-in after the two became embroiled in a row over the ceremony’s location. It will be the first time since the end of Argentina’s military dictatorship in 1983 that a president has not attended the inauguration of a successor. Mauricio Macri sought a court injunction affirming that Cristina Fernandez’s term ended at midnight on December 9. Power will now be transferred to the new president by Senate Speaker Federico Pinedo, who is acting act as temporary head of state for 12 hours. Cristina Fernandez de Kirchner and her late husband, Nestor Kirchner, held power in Argentina for 12 years. She is revered by some Argentines for expanding welfare benefits, nationalizing some companies and introducing new civil rights such as gay marriage. However, critics say she created a culture of handouts and clogged Latin America’s third-largest economy with interventionist policies. Mauricio Macri – the outgoing mayor of Buenos Aires and a former president of football club Boca Juniors – defeated Cristina Fernandez’s preferred candidate Daniel Scioli by 51.4% to 48.6% in a run-off vote last month. He is the first center-right leader to come to power since Argentina returned to democracy. Mauricio Macri has not detailed his economic policies, but said that he will need to implement swift and radical changes in order to win back market confidence. However, Cristina Fernandez de Kirchner’s party still holds the most seats in the legislature and could make it hard for him to implement big changes.